PAPUA New Guinea is pooled with the best tier two cricketing nations for the T20 World Cup qualifier. The Hebou Barramundis are pooled with last year’s T20 qualifier runner-up and pre-tournament favourite, Afghanistan. Division 1 cricket heavyweights Netherlands, Scotland, Kenya, Nepal, Bermuda and Denmark make up Pool B with PNG. Pool A consists of champions, Ireland and Division 1 teams Namibia, Canada and hosts the United Arab Emirates, with the four qualifiers in Italy, Uganda, USA and Hong Kong. The International Cricket Council has increased the number of teams able to qualify for the T20 World Cup from two teams to six teams. This increases the chances of the 16 teams vying for the six spots to travel to the T20 World Cup to be staged in Bangladesh next year. The Barramundis finished eighth in the last qualifiers held last year (2012) after finishing fourth in their pool to miss out on the qualifying stage. Barramundis captain, Chris Amini is confident ahead of the tournament. “I think we’ll be better prepared than ever before with us (PNG) playing in the South Australian Crickert Association Premier League,” Amini said. “We know what standard we have to be at if we are to make the top six. Obviously the division 1 teams are the favourites to progress but we are confident of causing an upset. All 16 will be hungry to make it to the next stage so it won’t be easy. “We weren’t sure what to expect when we played these teams last time. We pushed these teams all the way and had opportunities to beat them. We’re more experienced now so hopefully come November, we’ll be ready,” he added. They play two warm-up matches against fierce rivals Uganda and pre-tournament favourites, Ireland. This will be the Barramundis’ third trip to Dubai. 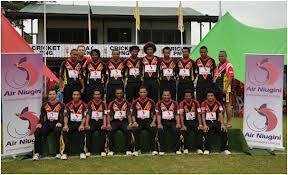 Qualification Fixtures: 12/11/2013 – PNG vs Uganda (warm-up) at Abu Dhabi Oval 1; 13/11/2013 – PNG vs Ireland (warm-up) at ICC GCA 1; 15/11/2013 – PNG vs Kenya at ICC GCA 2; 16/11/2013 – PNG vs Netherlands at ICC GCA 1; 17/11/2013 – PNG vs Afghanistan at Sharjah Stadium; 19/11/2013 – PNG vs Nepal at Sharjah Stadium; 21/11/2013 – PNG vs Scotland at ICC GCA 1; 22/11/2013 – PNG vs Denmark at Sharjah Stadium; 24/11/2013 – PNG vs Bermuda at ICC GCA 2.